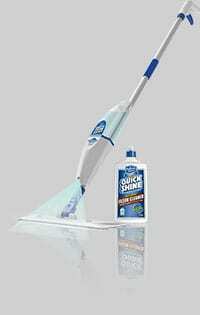 Quick Shine® Multi-Surface Finish and Quick Shine® Hardwood Floor Luster are water-borne polymer formulations designed to protect and impart a rich, deep, protective glow to sealed hardwood floors, wood laminate, stone, tile, vinyl and all other sealed hard surface flooring. After floor is free of debris, pet hair and dust, squirt Finish in an S-shape onto the floor in small 5 foot x 5 foot sections at a time. After floor is completely dry additional coats can be applied using the same method as above if a higher gloss is desired. Allow the 1st coat to dry for one hour before applying additional coats. 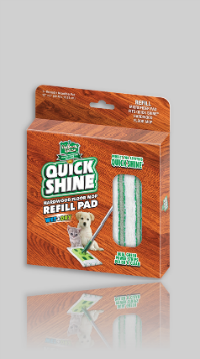 Keep the finish glow fresh by dry dusting weekly with a dry microfiber mop such as our Quick Shine® Hardwood Floor Mop in order to eliminate everyday dust and debris. 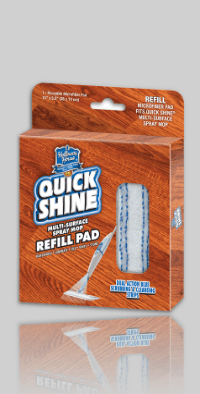 Every 2-4 months reapply a fresh new coat of Quick Shine® Multi-Surface Floor Finish or Hardwood Floor Luster to enhance the glow. 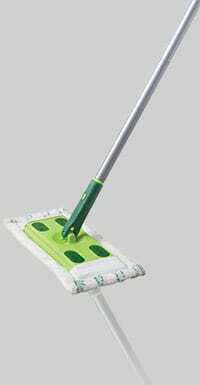 Remove all debris, pet hair and dust before applying. Each time you refresh repeat the “Maintain It” bullet points above for maximum gloss protection. If you have unevenly worn hardwood floors, simply add an extra coat to these areas. Uneven seals can occur where certain high traffic areas of the floor lose their polyurethane seal due to wear and tear. Either product is a great stop-gap method to forego a complete sanding and refinishing. We have had many consumers tell us these products have transformed their unevenly worn seal or completely unsealed hardwood floors.